Make Every Life Count. Whether it’s a child, a veteran, or someone in need, Make It Count Foundation will ensure that your donations are put where they are needed most. Every dollar makes a huge difference in another person’s life. Won’t you help? There are several ways for you to contribute to our efforts. 100% goes to carry out our mission. Make It Count Foundation is a 501c3, IRS registered public charity. 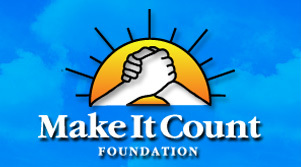 Make It Count Foundation Inc., PO Box 370, West Islip, NY 11795. You can make a one-time donation or monthly gift online using your credit card or checking account. Thank you for taking the time to contribute to Make It Count! © 2019 Make It Count Foundation. All Rights Reserved.